Nigel Farage, the leader of the U.K. 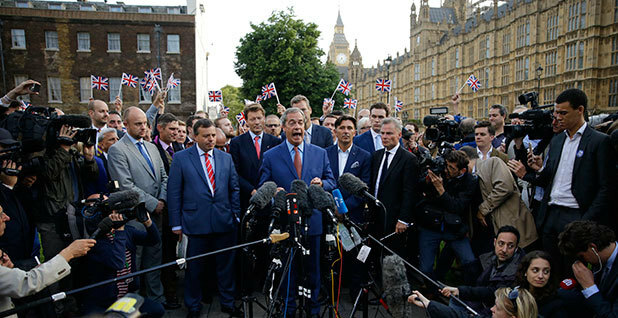 Independence Party, speaks to the media on College Green with the Houses of Parliament in the background after the country voted 48.1 percent to 51.9 percent to leave the European Union. Photo courtesy of AP Images. The European Union's second-largest economy voted yesterday to leave it, a stunning move that toppled Britain's prime minister and ushered in a new era of economic and political uncertainty. The British referendum to leave the European Union received nearly 52 percent of the vote. Prime Minister David Cameron confirmed in a speech this morning that the "will of the British people is an instruction that must be delivered." "So there can be no doubt about the result," he said. Cameron, who campaigned hard against Brexit, or the British exit from the European Union, said he will remain as prime minister through October to "steady the ship." Candidates to succeed him are likely to include some of his pro-Brexit rivals, including the former mayor of London, Boris Johnson. 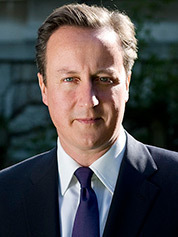 Cameron noted that the withdrawal would mean eventual changes in everything from the markets to Britain's relationship with the compact it is leaving. U.K. Prime Minister David Cameron has resigned after Britain’s vote to leave the European Union. Photo courtesy of Wikipedia. "We must now prepare for a negotiation with the European Union," he said. The treaty that binds the European Union together sets a two-year period of negotiations when any country opts to leave, but experts said Britain and the 27 remaining E.U. members could spend many more years hashing out new relations on everything from tariffs to British expatriates and foreign nationals to energy markets. Some businesses warned before the vote that they would be forced to relocate operations elsewhere if Britain left the union. The response to the vote was swift. The pound sterling sell-off began when early poll results gave the pro-Brexit camp an edge, and markets fell all over the world on investor fears that the move would affect trade. On Twitter, many leaders who had been in the "remain" camp, including people in Europe's climate change community, expressed shock and fear at the news. "Weep," the CEO of the United Nations' Sustainable Energy for All initiative, Rachel Kyte, said just after 1 a.m. EDT, tweeting a headline of the Brexit news. John Sauven, the director of Greenpeace UK, released a statement saying the organization is "determined that this country does not go back to year zero on environmental protection" in the wake of the vote. "There is a very real fear that Cameron's successor will come from the school that supports a bonfire of anti-pollution protections. The climate change-denying wing of the Conservative Party will be strengthened by this vote for Brexit. That means the green movement, indeed every Briton who values a clean and safe environment, may need to stand up for nature in the face of an attack on the natural world," he said. Meanwhile, Donald Trump, the presumed Republican presidential nominee, hailed the vote. Arriving in Scotland to check on one of his business ventures, Trump declared that voters in the United Kingdom have "taken their independence back." Opponents of Brexit both in and outside of Britain also worried before the vote that Britain's withdrawal could trigger a larger disintegration of the European Union as opponents of the union in other countries consider withdrawal attempts of their own. Sebastian Mallaby of the Council on Foreign Relations said earlier this month that French voters report even stronger opposition to E.U. membership than British voters have -- a fact that might encourage French leaders to make the withdrawal as hard on Britain as possible. "If Britain thinks it can easily negotiate a deal with Europe on the terms of its departure, it's got another thing coming, because the French need -- they don't just want -- they need to punish the U.K. to send a message to their own domestic populists who would like to follow Britain's example," he said. It's against this backdrop that Britain will begin to chart a new course for itself, both in gaining access to a continental energy market analysts say it needs to balance its own renewables-heavy power mix and on other important policy issues like climate change. The future looks murky this morning. "The truth is, nobody has any idea what will happen if we vote to leave," said Tom Burke, chairman of Third Generation Environmentalism (E3G), ahead of the vote. Because it will take years for the United Kingdom to sever ties with Europe, some say Brexit will have relatively little impact on Europe's pledge to last year's landmark Paris climate deal, which calls for an overall greenhouse gas emissions cut of 40 percent compared with 1990 levels by 2030. Britain and the European Union could agree -- and likely would agree -- to continue to work together, some said, ensuring that Britain would continue to carry out its share of the reductions and the rest of the compact would not have to take up the slack. Others predicted that Britain would need to formulate its own pledge while the European Union found alternative means to deliver what it had promised ahead of the December agreement. There was little doubt that Britain would remain a proactive player. "In the political and economic chaos we will now see, it is important to remember the U.K. has strong national climate laws, and there is no mandate or majority from this vote to unpick them," said Nick Mabey, chief executive of E3G. "The U.K. will ratify the Paris Agreement." U.N. climate chief Christiana Figueres said Wednesday at a press event for the Global Covenant of Mayors for Climate and Energy in Brussels that a Brexit would require the "recalibration" of Europe's contribution to Paris. While she said it was too early to tell whether that review of commitments would increase the deal's ambition or decrease it, she seemed to suggest Britain's withdrawal would buck the larger historic trend of "moving to larger tents of collaboration." Figueres, who is preparing to step down in July, will participate in a workshop in London next week as part of the Business & Climate Summit to consider ways to strengthen ambition. 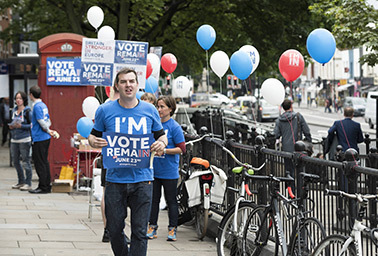 Supporters of remaining in Europe get out the vote in Islington, London. Final polls showed 72 percent of 18-to-24-year-olds backed the "remain" vote, and just 19 percent backed Brexit. Photo courtesy of AP Images. Britain's departure does remove or downgrade one of the most ambitious voices within the European Union ahead of 2018, when countries are asked to consider tightening their Paris pledges. In fact, the United Kingdom was scheduled to take over the E.U. presidency the year before that stock-take in 2017. "The U.K. has been a real leader within the European Union on climate issues for a long time," said Alden Meyer, director of policy and strategy for the Union of Concerned Scientists, in an interview before the vote. "If there was a vote to leave and that resulted in them not being able to be part of the E.U. policymaking process on climate, I think that would be a negative overall." Brexit also cast doubt on whether the United Kingdom would retain access to the European energy markets, which Burke noted it needs to balance its heavy use of renewable energy without requiring costly storage capacity. "Whether Britain would be able to negotiate and be part of the single electricity market would be one of the big reservations you'd have," he said. "That would chill investment until that becomes clear." While few thought the Brexit vote would erode Britain's own climate position, which is enshrined in law, there was some chance that it could give U.K. opponents of climate action a boost. Some of the leaders of the Brexit movement cast doubt on man-made climate change, and polls showed that pro-Brexit voters were twice as likely to doubt established climate science as the average Briton. Paul Bledsoe, a former Clinton White House climate aide and former fellow on climate change at Oxford University, said in a statement this morning that movements like Brexit erode the world's ability to act collectively to confront global problems like climate change or terrorism. "At the same time, the trend in international climate protection reflected in the Paris Agreement is one of global federalism, in which individual countries take action that adds up to real progress," he said. "National action is still the heart of all climate action, and the UK is committed, so the Brexit in and of itself should not slow climate protection efforts."